Happyyy Monday my friends! I hope you are having a wonderful long weekend Monday – It is definitely feeling like fall around here with the cooler temperatures and the pumpkins out in full blast! I am part of a fun little blog hop with some talented friends today and we are all sharing our entry way’s decked out for fall! If you are coming from Taylor’s page at Uniquely Taylor Made, Welcome! Thank you for stopping by my blog and I hope you will stick around and come follow me on Instagram. If you are new around here, you know that I just moved across the country and miss my home (pictured below) terribly! I am sharing photos from last year – and I hope they inspire you in decorating for this fall! Fun side note.. I took these two photos on separate days… so by the second day, the “gather” sign had fallen off – because yours truly had used TAPE (yupp.. you read that right hahahha!) to put it up. Sometimes, the itch to get stuff up pronto over takes logic and reason hehe. 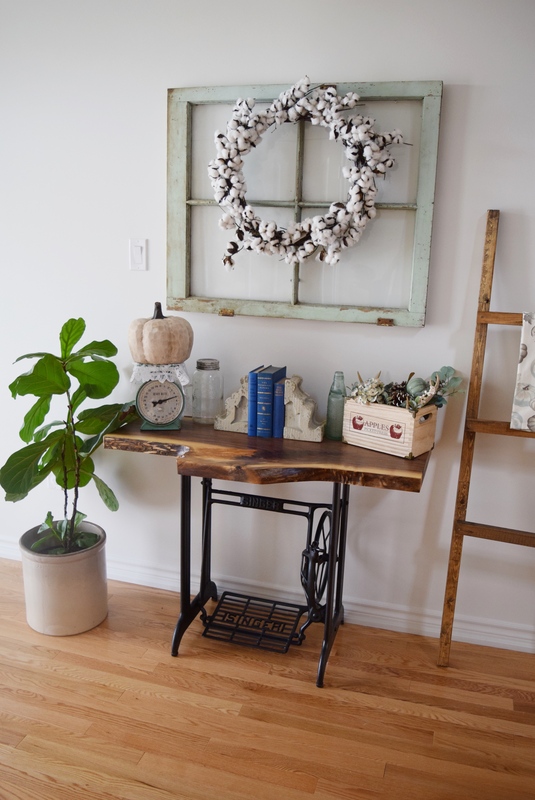 This front hallway, also has a cute nook where the stairway comes down where I have added one of our extra dining room chairs and put a crate as a little side table next to it. The pumpkins and cotton gave also descended onto here. I mean , its pretty basic and I tried to use what I have at home and spend money on a budget because this mama has a tight budget for seasonal decor (Check out my tips HERE) – But some things were definitely new purchases, like these AMAZING turkish towels that I am using as throw’s from Fringe Towels, the mint pumpkins and some faux foliage. I try to keep it pretty basic so I can get creative and play with the decor that I have versus buying everything new for a season! I hope you enjoyed this post! Also, leave me a comment or come say hello on Instagram, Pinterest, and Facebook. 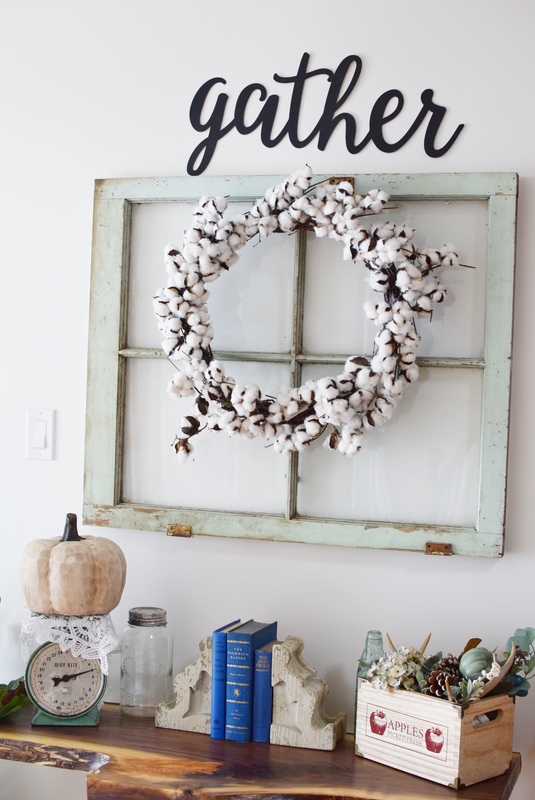 Next I want you to head on over to Amy’s blog at The Cuter Tudor and check our her welcoming entryway dolled up for fall. I also hope you will stop by all the other blog’s in this blog hop and check out all the amazing inspiration put out by my friends! Your entry way is beautiful Areeba! I love the colors you’ve used! 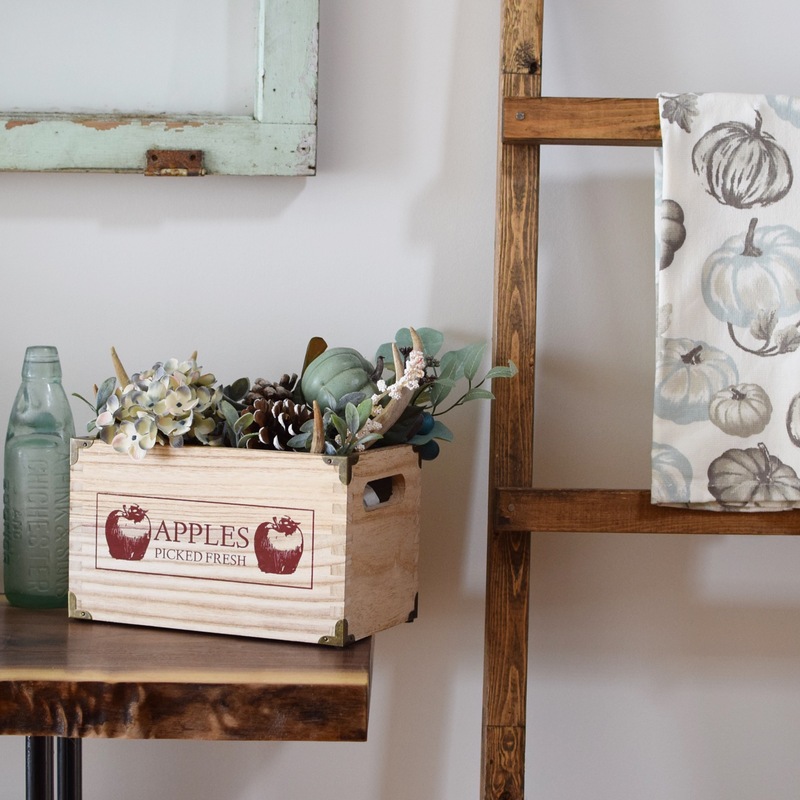 Love that apple crate and all the neutral textures that cozy up the space! Areeba! I love your fall home. 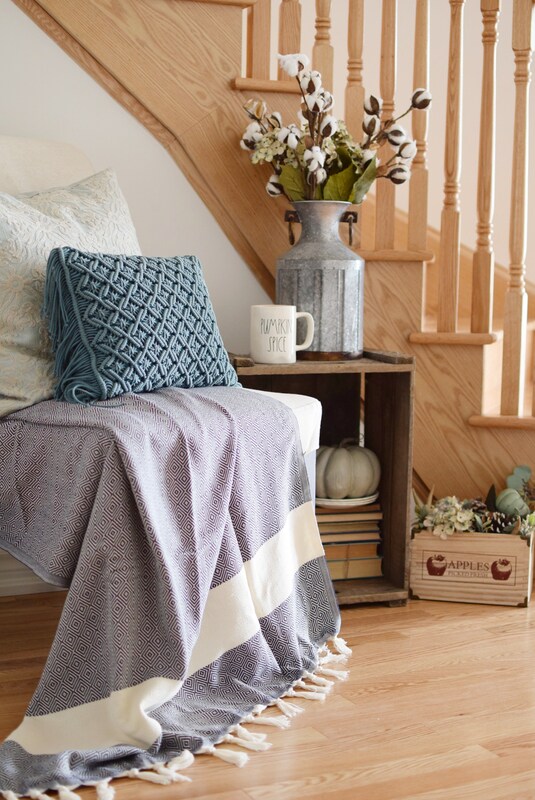 The simple splashes of color are amazing and so cozy! Thanks for joining us on this hop! I love the beautiful mix of natural elements! We warm and inviting!